"Join Abigail and Miss Kitty as they embark upon a fantastic adventure full of wit and whimsy where things are never what they seem, not even their journey's end. 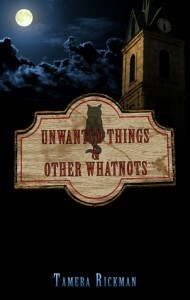 Brimming with colorful characters, and peculiar places, Unwanted Things and Other Whatnots is sure to capture the imagination and keep the reader engaged, eager to see what happens next." And it has no reviews. According to the information on Amazon this is a Middle Grade. I don't yet have an opinion on that score. Um. Yeah. I'm calling that an editing failure. I glare at the book title. What a coincidence! Hit the reader over the head, why don't you? Why do they say this to her? We aren't told. But I do think I can guess, we readers need to be told she's "unwanted". Personally, I think there are much, much better ways to do this. Preferably by being shown, not told. And definitely not being smacked with it in such obviously contrived way. Besides, it's a very lame insult. '“May I help you?” He loomed over her, talking down. Okaaaaaaaaaaaaay. That's a bit...over the top. Seems to me he could be shown to be not very nice, and insist she wait outside without going from "May I help you?" to blowing a gasket in 30 seconds for no apparent reason. It's also clear that her mother and her sister are awful to her, a la Cinderella, but we're given no explanation as to why. There's a clocktower in town, and we're told no other timepieces are allowed. "...no watches on chains, no house clocks, no wristwatches, nothing." The only clue as to time/place so far is the mention of wristwatches and her mother and sister driving off in a car. Beyond that I have no idea where/when this is.